The June VHF contest started about 2 hours ago. 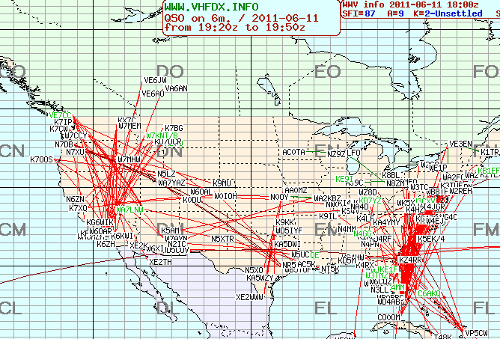 Yesterday people were working from Minnesota to the East Coast on 2m via an E opening. 6m has had been hopping as well. Today the bands are pretty well shutdown in Minnesota. Look at the map (above) and notice that the 6m openings are on the East Coast and West Coast but NOT in the upper MidWest. ---Argghhh. Looking at the 2m APRS propagation map it shows that band conditions have fallen off pretty dramatically in the past 4 hours.